Pepper spray enables you to defend yourself while keeping a safe distance from the attacker. A one second burst to the face will cause temporary blindness, choking, coughing, and nausea - bringing the attacker to his knees. The active ingredient in the spray is Oleoresin Capsicum, commonly referred to as red pepper. When considering which pepper spray is most effective, one must consider the percentage of pepper being used and the heat rating of that pepper. 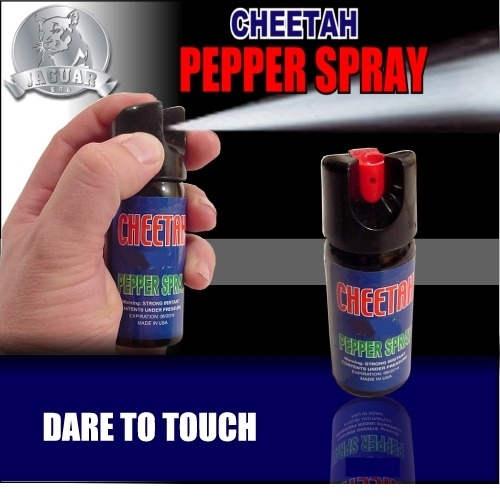 All Cheetah brand pepper sprays are two million S.H.U., which is the highest available. The potency of this spray enables it to bring down even the most aggressive attackers.